Enjoy sightseeing through Seattle on a fantastic City Sightseeing bus tour! With the handy unlimited hop-on hop-off feature, passengers can explore the city at their own pace for 1 or 2 days, depending on the ticket chosen at check-out. Discover sights including Space Needle, Puget Sound, Pike Place Market, Central Waterfront and plenty more. On top of this, you will be able to enjoy 360-degree views of the city as you travel from the double-decker, open-top buses, plus a wonderful English commentary. It’s the perfect way to see Seattle. 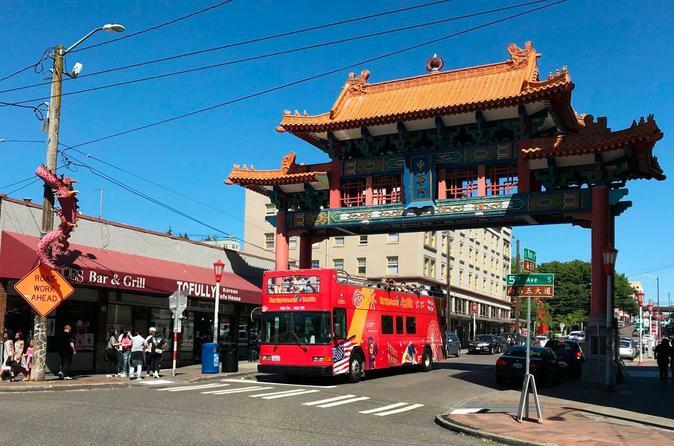 Hop-on to a City Sightseeing Seattle bus tour and embark on a wonderful adventure through Washington State’s largest city. Along the bus route, passengers will have easy access to the city’s biggest and best attractions and you will be able to explore them at your own leisure – once you’re ready, just hop back on the bus! Hop-off at the Central Waterfront, one of the cities tourist hotspots, and find yourself immersed in the centre of many attractions including the iconic waterfront Ferris Wheel, Seattle Aquarium and Pike Palace Market. The Central Waterfront replaces the former Alaskan Way Viaduct and has since become an important part of Elliot Bay Shore. Another notable spot in Seattle is the Space Needle. It’s one of the tour stops along the route giving passengers close access to this wonderful attraction and one of the tallest structures in the city. Hop-off for a once in a life time experience at the Space Needle Observation Deck or you can enjoy an amazing meal in the revolving restaurant! Don’t finish your sightseeing without hopping off at the Puget Sound. This location is famous for its unique sound that stretches from Washington State’s mainland to the Olympic Peninsula. It attracts thousands of tourists every year who want to discover the sound created by this natural habitat, Puget Sound, and is also one of Seattle’s most beautiful and picturesque areas. Discover the cultural hotspot, Seattle Chinatown, with its colourful buildings and plenty of traditional eateries serving countless culinary delights. Visitors can immerse themselves in more of the cities culture and heritage at the Seattle Centre, home to many museums and attractions. If you’d like to break up your tour with a shopping trip, hop-off at the Tiffany & Co. tour stop and enjoy close access to Seattle’s best shopping district. Passengers can hop on and hop off at any of the tour stops along the route. With your ticket, you will also enjoy a FREE walking tour, allowing you to learn more about Seattle and explore more of the sights!